MB Crusher: accounts of crushing from the heart of Baviera - MB S.p.A.
We are in Mömlingen, a small town in the heart of Bavaria, where recently-finished work has brought new splendour to one of the German town’s main squares, in front of the Church of St. Martin. A location rich in charm and historical importance, and the subject of a global restoration project for the square in front of the church: a challenging project, which saw the use of the legendary crusher bucket by MB Crusher, the BF90.3. Fitted on a Doosan DX235 excavator, the BF90.3 crusher bucket was used for the on-site crushing of cobblestones and blocks of limestone from the preceding excavation of the square. Recycled directly on site, these crushed aggregates were then used on the same work site to fill the sub-floor for the creation of the new square. There were two evident advantages for the company using the crusher bucket by MB Crusher: the elimination of costs for dump disposal and for the purchasing of new aggregate materials for filling, and the consequential complete recycling of excavation materials. 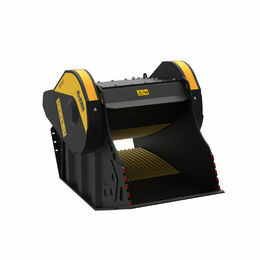 The use of the crusher bucket also allowed the construction company to completely recover the materials present on-site, with an evident reduction in emissions and consumption and a general reduction in noise pollution (a fundamental aspect nowadays for the management of urban work sites). There is of course also the simplicity of handling - the crusher bucket was transported installed directly on the excavator - an important aspect for any company operating in the sector that has to take on operations in urban work sites. An experience that was characterised by respect for the environment and the possibility of moving in limited spaces: two important and delicate themes that are often related to work in residential areas. This was the first crusher bucket in the world ever to be created and patented. Designed to resist the most challenging conditions of any work site, it is suitable for excavators from 21 tons upwards. This year it was further optimised in order to allow an increase in productivity, new options for the regulation of the dimension of materials in output, increased resistance and a reduction in maintenance times.